DO NOT approach snakes, large kangaroos or wallabies, microbats or birds of prey. These species require specialist handling and MUST be rescued by TRAINED rescuers. PARK SAFELY WITH HAZARD LIGHTS ON – Try to warn oncoming vehicles to slow down. Do not park your vehicle if not safe to do so. Be alert to your surroundings and any traffic. PROTECT YOURSELF – Personal Safety is foremost. Injured animals don’t know if you are going to help them or harm them. They may kick, scratch or bite. Also ensure you obey road safety rules. APPROACH WITH CAUTION – Speak quietly and try not to frighten the animal. Remember injured wildlife may be in pain and very scared. REMOVE THE THREAT – Keep people and domestic pets away, remove the animal from the road if necessary and if safe, gently wrap the animal in a towel and then secure in a hessian sack or well-ventilated, lidded box for transport to a vet or to await the arrival of a wildlife carer. CALL FOR HELP– If you find an injured or orphaned animal, call for help as soon as possible. 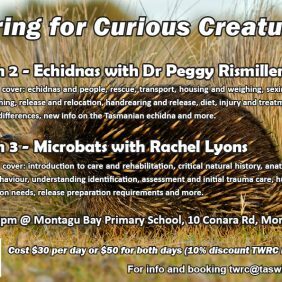 A wildlife carer will talk you through removing a joey from a mother’s pouch or helping an injured animal. REMOVE FROM THE ROAD – If the animal has died and it is safe to do so, move the animal well off the road to avoid secondary kills of birds of prey, devils and quolls which like to eat dead wildlife. ALWAYS CHECK THE POUCH – Marsupials like wallabies, kangaroos, possums and wombats are often killed on roads leaving orphaned pouch young still alive. If the pouch is empty, but the teats are stretched or enlarged with milk, please check the surrounding area for a joey. It may have been ejected on impact, or climbed out and be hiding nearby. If you suspect an older joey is nearby and you can’t find it, take careful note of your location and identifying landmarks so a wildlife rescuer can continue the search. REMOVING POUCH YOUNG – (UNFURRED/ATTACHED) Orphaned joeys must be removed carefully. If the joey is unfurred and still attached to the teat, it is preferable to transport the joey and deceased mother together to a vet. If this is not possible, please follow the instructions ‘Identify Location’ below and notify Wildlife Rescue as soon as possible. Unfurred joeys cannot hold their own body heat, so if the joey has been removed from its mothers pouch, keeping it against your skin inside your shirt will keep it warm. REMOVING POUCH YOUNG – (FURRED/UNATTACHED) If the joey is not attached to the teat, remove it carefully by directing its back first through the pouch opening. Wrap the joey in a towel/clothing, or place it in a beanie or pillowcase. If possible, also place the wrapped joey in a well-ventilated and secure, lidded box or container. KEEP WARM, DARK & QUIET – An injured animal will be in shock so it is vital that they be kept warm, dark and quiet and taken to the vet immediately. NO FOOD OR WATER – Do not give the animal any food or water unless instructed to by a vet. LARGER ANIMALS – For larger animals, you may need to call for assistance. 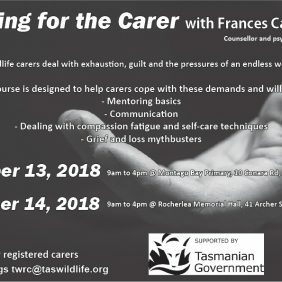 Tasmania’s 24-Hour Wildlife Emergency Hotline is able to offer advice, put you in touch with a volunteer wildlife rescuer or carer, vet clinic or other organisation. VET ASSESSMENT – All sick or injured wildlife need to be assessed by a vet as soon as possible before going into care. Most vets will offer wildlife consultation free of charge, some may not. If you can, please call the vet to let them know you are coming. Not all vets handle all species of wildlife but they will help wherever possible. IDENTIFY LOCATION – If possible, stay with the animal until help arrives. If unable to do so, the exact location must be highlighted (tie something bright to a post/tree, draw a large cross in gravel or place large sticks to form an arrow) in order for the rescuer to immediately locate it. Note any identifying features of the location that can be later found by wildlife rescuers. RELEASE FROM CARE – Many young animals can possibly be reunited with their parents, if we know the exact location that the animal was found. Many native birds and animals are also very territorial and it is critical that when they are ready for release, we release them back to their home, to ensure their best chance of survival.